Years ago, when I first became housebound (and eventually bedridden) with ME, I had very few places to turn. I was living alone at the time, and while I had some friends and family nearby who were willing to help, my sense of pride prevented me from asking for the wide range of assistance I suddenly needed. Overnight, I had gone from working full-time to being unable to grocery shop, do my own laundry, clean, cook or otherwise care for myself. Doctors did not have answers for me, and the ordeal of getting out to appointments in and of itself would often set me back further. Desperate for help, I contacted various agencies and organizations looking for assistance. However, more often than not, I was turned away. Unless I required hospice care or had a lot of money to spare, few had anything to offer me. Indeed, I have been continuously surprised by the scarcity of resources there are for those who are chronically housebound and/or bedridden. These lack of services became even more evident to me once I began blogging. Unfortunately, I have received numerous emails over the years from other bedridden patients who have been unsuccessful in seeking the same kind of help that I, too, have had such difficulty finding. In light of that, I thought I'd share a few services I've come across in the hopes it may provide some benefit to those who need it. Please realize that, unless otherwise noted, these are agencies and resources I've found simply by doing a basic web search over time. I am not affiliated with any of these companies or websites, nor do I know anything about the quality of service or expertise they offer. It's important for anyone to do their own research about an organization when seeking out professional help. First, there are some services that are provided by Medicare and Medicaid for those who qualify. For a comprehensive list of what Medicare offers in home health care services, please check out their Medicare and Home Health Care brochure. Regretfully, many of the services Medicare does NOT offer are those that bedridden/housebound ME patients often desperately need -- particularly those who cannot rely solely on friends and family, or who spend much of their days alone. These exclusions (if they are the only assistance you need) include personal care given by home health aides (such as bathing and dressing), meal delivery and homemaker services like shopping, cleaning and laundry. Fortunately, there are many in-home health care agencies around the country that will provide cleaning, shopping, meal preparation and some degree of medical care, but at a fee. For those who can afford it, a quick online search can provide information on home health care in your area. Nurse visits can also often be arranged through these agencies; however, generally speaking, doctor visits can not. Most agencies will instead provide transportation to a doctor's appointment for those who are able (free transportation services are also often available to those who qualify). However, for many with severe ME, a trip to the doctor's office, even with assistance, is not always possible due to the severe (and sometimes permanent) setback such an outing can cause. In the last many years, there seems to be a growing number of organizations throughout the country that are beginning to offer physician services in the home. One such organization is the Visiting Physicians Association. Also, the American Academy of Homecare Medicine offers a list of doctors by state who, as a public service, also make house calls. Please again note that I am offering this information as a resource only and have no other knowledge about these agencies beyond what is listed on their website. Also, keep in mind that while these doctors make house calls, they may not (and, in most cases, probably do not) have extensive or even basic knowledge about ME. Regretably, it is very difficult to find a doctor well-informed about the complexities of this disease, particularly in its severest form. It is even harder to find one who is also willing to make house calls. For those who may not be aware, Dr. Charles Lapp, an M.D. in North Carolina, recently put a call out to severely ill/bedridden ME patients. Right now it appears he is merely collecting the information, with possible hopes of trying to find ways to provide care to these patients in the future. For more information about contacting Dr. Lapp, please see here. If nothing else, it's important for doctors to realize how many of us are out there looking for help. Specialty doctors for basic dental or eye care at home can also be extremely difficult to find. However, there are some dentists and optometrists who will offer limited care in the home for those who are bedridden. You can contact your state's dental or other specialty organization to ask if they are aware of any doctors in your area who make housecalls. For example, with some persistence, I recently found an optometrist willing to come to my home by emailing my state's optometry association. A couple years ago, through the help of a local acquaintance, I also found a dentist in my area who routinely makes house calls, which turned out to be a true life-saver for me. I would never have survived such an extensive outing to fix all the issues I was having. Many cities also provide mobile services for ultrasounds, EKGs and X-rays (with restrictions), provided you have a doctor who will order the tests for you. Please note, however, that many of these doctors and services do not accept insurance, or insurance will not pay because the services are provided in the home. This of course means that, unfortunately, these options might not be feasible for most patients. I've also received many emails over the years asking how I avoid bed sores, or what kind of products I use to ease my comfort or accomplish certain tasks throughout the day. I am fortunate that I am well enough to sit up and turn myself in bed, and can still get up to use the bathroom on my own each day (the latter with the help of my wheelchair). As of yet, bed sores have not been an issue for me. However, there are products available to those who find this a concern, as well as other products designed to make life a bit easier for the bedridden. AllegroMedical is one site where you can purchase such items, but there are many other websites available as well. Those who have read one of my former blog entries, Eyes Wide Shut, know that, as a result of cognitive problems stemming from ME, I rely on a text-to-speech program to help me navigate online and to read all my emails and other items for me. There are also several speech-to-text programs available for those who would find that helpful. I don't have an iPod or iPad, but I know some versions have a voice application called Siri that could be useful to some patients. I also participate in my local library's Books-By-Mail program, which is a free service that lends audio and large print books by postal mail to the visually impaired and disabled. Many libraries have similar programs. In addition to all the above, Emily Collingridge wrote an excellent book called Severe ME/CFS: A Guide to Living. It is designed specifically to help provide a wide range of resources to those with severe ME and/or CFS (geared towards the UK, but useful for all). Her book can be purchased through her website (http://www.severeme.info/). Lastly, this illness, especially in its severest form, is incredibly isolating. I have received many emails requesting information on how to meet and communicate with other bedridden patients. This is difficult for many reasons, but primarily because most bedridden patients are too sick to be online for any length of time, and thus cannot fully participate on social media or other similar forums. However, for those who are able, sites such as Phoenix Rising, HealClick, ME/CFS Forums and Facebook social groups like Severe ME Chat and Support. might be useful and provide some comfort. *More blogs have since been added to the above list after others brought them to my attention. "Just knowing you're not alone is often enough to kindle hope amid tragic circumstances." If others have additional resources to offer on any of the above, please share them through the comments section below. My research abilities are restricted due to my physical limitations, so I'm certain there are things I have left out. Also, the resources listed in this post are specific to the U.S. since that is where I live. No doubt resources in other countries will differ. Thanks for understanding! Great info. Thank you for sharing. You posted - "Medicaid offers more services than Medicaid" - I think you meant "more services than Medicare"? Just checking. I always get those two confused and once had a surgeon yell at me over it. Thanks, Julie! Oops -- yes, I meant to say Medicaid offers more services than Medicare. I made the correction; thanks for noting it! I often confuse the two. How awful a surgeon yelled at you for it! Another source for audiobooks is the National Library Service for the Blind and Physically Handicapped, operated through the U.S. Library of Congress. http://www.loc.gov/nls/. A physician's letter of need is required, but once one is approved, books can be downloaded or sent via mail. This service also provides special players that allow one to slow down and change the tone of the reader's voice. Thanks for the info, Liz! I will have to check it out. I could have written your first paragraph myself. Hate that so many of us go through this. Anyway, I wanted to comment on this survey by Dr. Lapp. Unless he's changed a lot in recent years I don't trust him at all. He advocates a "stepwise program" and states that patients can't just lie in bed or they'll get deconditoned and must exercise and rest throughout the day in intervals. He claims 80% of patients improve with this program and does not mention anything about neuological or cardiac/circulatory problems or many of the classic M.E. symptoms. I think he treats fibro patients and people diagnosed with CFS who likely have a varitey of conditions. He doesn't seem to have a clue about M.E. Please look him up and check out his program before signing up for anything having to do with him. I, too, have heard some of Dr. Lapp's erroneous and potentially harmful comments, which appear to be about the vague symptom of ongoing fatigue vs. the neuro-immune disease that is ME, and I share your concerns. The hallmark of ME, of course, is a substantial worsening of symptoms after mild exertion, and this is especially true in severe ME patients, some of whom can't speak or even eat or use the bathroom on their own. I personally can sometimes crash just from getting dressed if I am not careful. I agree that, at least currently, he seems to have no conception of what it's like for the sickest patients. I find that a problem even some other ME specialists as well because no one actually sees the sickest patients unless they are willing to make housecalls. However, I felt it was worth sharing the link regardless, since he only appears to be collecting the information at this time -- perhaps simply to see how many bedridden patients are out there. As I said in my post, it's important for those who seek professional health to do research prior to seeing or consulting with any doctor or organization. I am providing the info as a resource only. Thanks for your comment. Thanks for the long and considered reply! I think I came across more harsh than I intended in my comment. It is a big problem that most ME specialists aren't too familiar with severe/very severe ME. And a problem for all housebound people that there aren't enough services. I do think things are a little better with the baby boomers aging, though. I also neglected before to comment on the resources you posted. That's a lot of helpful info, thanks so much for putting it together! For severe ME blogs I also like Dead Men Don't Snore, Documenting ME and Cheering from the sidelines. For ebooks and audio books, in the US there is a selection available via library websites. These can only be accessed if you have a library card, but local branches should be willing to send someone to get you a card and perhaps even show how the library site works. This will be different for each state but it's been a great resource for me. Hope this might be helpful for someone! I didn't think you came across as harsh; it was an important point to make! 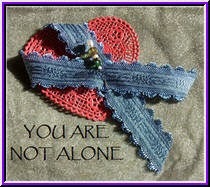 Thanks for the links to the other blogs written by severe ME patients. I will definitely check them out! Thanks, too, for the point that many ebooks and audiobooks can also be downloaded online. I take advantage of that service often as well. :) Appreciate the comments -- thank you!